Now that I think of it, it has been almost 8 years since I have this watch. And finally, completed! 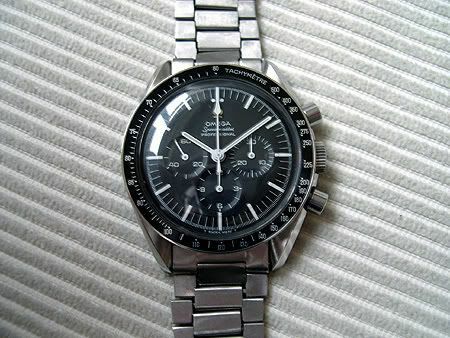 A few weeks back I noticed this reference 1039 bracelet for sale, which belongs to this type of Speedmaster. According to most sources that is, you are never sure with those vintage Omega watches. My watch left the Omega factory in 1968 (October 22nd to be exact) on a journey to Norway. The reference 1039 was used on this model in 1968 according to information by Omega. However, I have also seen them on earlier models as well. 1968 is also the year that the reference 1171 bracelet got introduced for its successor, the Speedmaster Pro with caliber 861 movement. Earlier models of the Speedmaster, like the ones without ‘Professional’ and without the crownguard, might have the reference 7912 or 1506 bracelet. However, it is also believed that the 105.012 had the reference 1506 bracelet. Confusing eh? I bet Omega didn’t care as much then as we (collectors) do now! Anyway, I am happy with it. It is not a bracelet to use for everyday wear, because it is very flimsy and probably will break without too much effort. However, it is nice to have your vintage watch completed with the original stuff. I will keep wearing this watch on a leather strap or on the nicest Speedmaster bracelet ever, the reference 1450. The restoration review on my Speedmaster Pro will get finalized soon I reckon. There are no more parts/accessories required.